Fancy Horse. Expensive Trainer. Why So Unhappy? You’ve done everything the ‘right’ way. You bought the fancy horse. You hired the big name trainer in the area and you’ve done everything they said. You love being around talented horses and enjoy being immersed in the competitive atmosphere, but you are feeling less confident than ever. What's missing? There may be more you need to learn than what is being presented in the narrow focus of a top dressage barn. Many students come into dressage in a way that they hand over their dream completely to their trainer. They do everything their trainer says and yet after investing many years (and a whole lot of money) they find themselves disappointed, confused, and less confident about their riding than when they started. How can that be? I spent 20 years as a trainer at a top competitive dressage barn. There were multiple trainers and many horses in full training. Some students were happy and kept improving and some grew increasingly frustrated and ended up riding less and less. Why? The students that were the happiest about their progress were the ones who were very clear about their dreams and considered it their own responsibility to gather all the skills required to achieve them. They prioritized a deep connection with their horse, and sought trainers that created realistic strategies based on their specific goals. That may sound obvious, but there were plenty of times I saw students who hadn’t fully thought about their own dreams. They were sold inappropriate horses and were following plans that in reality would never get them to their goal. Deep down they knew something wasn’t right, but they just kept doing what they thought they were supposed to be doing. For example: A marginally confident rider in her 60’s who was very comfortable on her aging schoolmaster was advised to purchase a younger, more athletic, and untrained horse instead of another schoolmaster. This stopped her progress dead in its tracks. Her trainer was now doing all the riding. Other people ‘oohed and aahed’ when her horse was ridden, but it didn’t make her feel better. She didn’t need a fancy, competitive horse; she just wanted a safe horse she could ride and learn upper level movements on. Now she was paying to sit on the sidelines and feel bad about her lack of skills, while convincing herself that it’s ‘best she didn’t ride so she didn’t ruin this fancy horse’. That doesn’t sound like fun. There are ways to set yourself up for success! - Why do you love horses? - Why do you love dressage? I want to have a horse that I have a connection with, enjoy riding, and that I can progressively increase my skills on. I want to sponsor a trainer with a horse that is way beyond my skill level so I can be the proud owner as the horse goes as far as he can. There is no right or wrong answer here, but you have to know what your vision is. The plan for each of these options is completely different. Unless you are all-in on choice #2 (sponsoring your trainer), then you need a horse you love to ride, or you need to learn how to love riding the horse you have. I see too many riders with Dream #1 who end up stuck in option #2. This is what I call becoming an accidental sponsor. If you bought a horse that you were even slightly intimidated by but had big hopes and dreams about riding, yet now you spend all your time and money watching other people ride him, you are now an accidental sponsor. Sometimes this really does happen accidentally. Sometimes horses don’t turn out the way we think they will, or unforeseeable events happen that cause you to not be doing the riding. It’s possible to be somewhere between choice 1 & 2. There are some times where a trainer needs to spend more time on your horse during a specific stage of training, but this should be temporary, and the goal is still to get you and your horse working together. There are a lot of really fine trainers out there who truly have students’ best interests in mind. Sadly, there are plenty who don’t. If you trust that your trainer understands your goals and is working towards your and your horse’s best interests, then you are very fortunate! Sometimes, I am sorry to say, some trainers create accidental sponsors on purpose. There are trainers out there who intentionally recommend horses to students when they know darn well that student can’t handle the horse. They know this will guarantee the horse has to stay in training with them. They will be paid to train it until it gets sold. The cycle repeats with the purchase of yet another unsuitable horse that needs to be in training. When this cycle repeats very often, the student has become what I call a Sales Commission Vending Machine* in addition to being an Accidental Sponsor. That’s a very expensive way to get a front row seat at the training arena. If you are getting a weird little feeling in the pit of your stomach by reading this, that may mean you know you have to change something. Take a deep breath and ask yourself: Does your horse have the same pit in his stomach? It’s OK if you don’t know how to change things yet. Just celebrate your new awareness. If you have been immersed in this competitive trainer-loyalty-dependent atmosphere, it makes sense that you wouldn’t be presented with tools for realizing your specific dream if it lies beyond Train, Compete, Win. There’s nothing wrong with you if you don’t want to compete. There’s nothing wrong with you if you do. There are many ways to enjoy dressage! YOU, the student, need to be in charge of your experience. YOU need to know your vision and be responsible for doing what you need to do to achieve it. This shift in mindset alone has helped many students break the cycle of frustration and disappointment in themselves. There are things you can do that can totally transform your experience of progressing in dressage. Maybe your horse is thriving in his program and it would just be better if he was owned by someone else who matched his temperament, movement, and skills. Maybe your horse is just as frustrated as you are and wants more variety. Maybe your horse needs you to be his special partner and wants you to be happy to be around him. Pretend you do know what you need to change. What would it be? Trust your instincts. Where could you go to get some help with it? What if you could feel like he is YOUR horse, and that you choose to have someone else train him rather than feeling like it is your trainer’s horse that you get to pay the bills for? You don’t have to sit on the sidelines waiting for it to be your turn. It’s possible to learn to become more confident with your horse. You are allowed to create the life that you want with your horse. If your dream is to have a horse that you have a connection with, enjoy riding, and that you can progressively increase your skills on, then take charge of that. You are allowed to advance your own horsemanship education separately from your sport-specific trainer. Dressage specialists aren’t necessarily the people you need to go to for big-picture coaching on your mindset, or on how to build a relationship and great communication with your horse, or to learn more excellent general horsemanship and riding skills… But these are definitely skills necessary for happy progress in dressage. *For the record: There's nothing wrong with sales commissions. Like in real estate, you are paying for professional expertise. There should be full transparency. I have seen students make very expensive mistakes just to avoid paying a commission. I have also seen trainers give bad advice just to make a commission. You need a trainer you can trust. 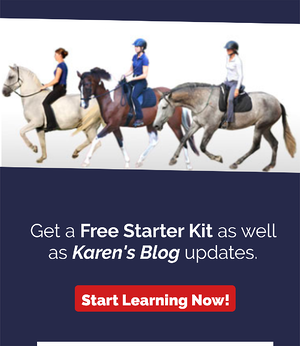 Karen Rohlf, creator of the Dressage Naturally program, is an internationally recognized clinician who is changing the equestrian educational paradigm. 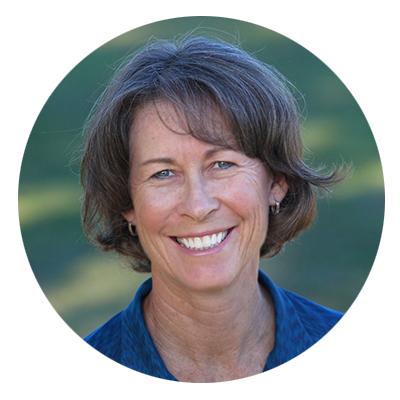 She is well known for doing dressage with a priority of partnership, her student-empowering approach to teaching, her virtual courses, and her positive and balanced point of view.